The day started with a BANG and me deep in sleep, finally adjusting to not having to wake up at 5:45 am. Didn’t take long, did it? Only this was the day I actually needed to get up early to take the cat to the vet for her checkup and dental cleaning. No espresso or breakfast, just a quick shower then the CK’s and I were out the door – with the promise of stopping at Krispy Kreme after dropping off Smokie. And holy cow was the trip worth it. Cream filled, chocolate covered goodness! 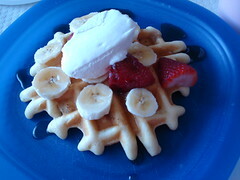 Heaven in breakfast form! An extra 350 calories to burn off later! Oh crap, that’s right. Anyway, the rest of the day involved eating leftover tacos, hitting the treadmill, and finally listening to CG practice cello in front of her new mirror that we purchased at Target yesterday. A little reading and poking around on iTunes, then the CK’s were down for the count as Hubs and I hunkered down with a Netflix DVD and alcohol-based snack. Couldn’t ask for a more productive day, could we? Not a chance! Except, guess what? The CK’s are suffering from swimming pool withdrawal, as if they’re going to dry up after being chlorine-free 24 hours straight. Did I mention it was cold & rainy today? Things do happen for a reason, but I have a feeling we’ll be right back at that pool in no time.